Home Conversation Class 101 ESL Activities: For Teenagers and Adults | Just What you Need! Tired of Wasting Time When Lesson Planning? During my 10 years teaching English to students in South Korea, I wasted so much time cruising around the Internet looking for some new ESL activity ideas for my classes. There’s a lot of junk out there that is more time-filler than it is actually useful for students. And I’m all about helping my students become better at English! There are also some good ESL activities and games on the Internet. However, they’re not explained in enough detail so it requires a ton of effort to figure out how to use them. And there are no teaching tips to help you avoid the pitfalls that go along with it. 101 ESL Activities has only the good stuff that your students will like. The majority of them are no-prep/low-prep to make your lesson planning easy. The descriptions are very detailed and step by step so you’ll be able to have a quick read and then go use it in your class. There are teaching tips to help you make the activity awesome. And also ones to help you avoid the things that can go wrong. New to Teaching Teenagers or Adults? If you’re new to teaching teenagers or adults, or new to teaching in general, it can be hard to figure out how to use up those 1, 2 or even 3 hours with each class. This book will help you fill that time with student-centred, interesting, engaging ESL activities that your students will love. Best of all, they’ll help your students learn English. They’ll get more confident in their abilities, particularly speaking. 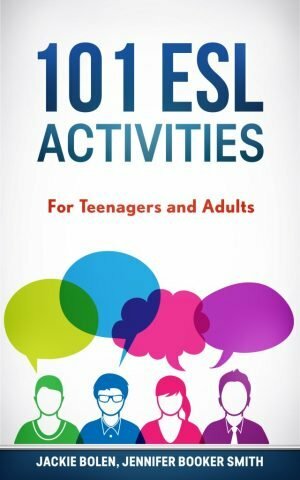 There’s enough material in this book to last you an entire year and the activities are organized by category: speaking + listening, 4-skills, reading, writing, and warm-ups/icebreakers to make it easier to plan. Needing some Fresh, New Ideas? After a few years of teaching English, it’s easy to feel burnt-out and lesson planning can become a really tedious chore. If you’re feeling bored with teaching, it’s likely your students are bored with your classes. This book will help you interject a few fresh, new ideas in your classrooms. This will keep things interesting for you as well as the students. Jackie Bolen and Jennifer Booker Smith have a combined two decades of experience teaching English to all levels, ranging from total beginners to teacher training. Jackie holds CELTA/DELTA certifications and Jennifer has a Masters in TESOL. They wrote the book that they wish they’d had when they first started teaching. It’s really easy to get the book on Amazon. The (cheaper!) digital version can be downloaded onto any device (smartphone, Mac, PC, tablet) by getting the free Kindle reading app. Want to See an Example Activity from the Book? Do you have some go-to English activities or games that you use every single semester? Leave a comment below and let us know what you think.